Barakat project weaver in Afghanistan. Establishing the value of a hand-made Oriental rug is a unique science. A rug’s origin, age, condition, and the many procedures that went into its creation, ranging from technical processes to artistic expression, all contribute to its desirability and collectability. While there’s no substitute for a certified rug appraisal, acquiring a basic understanding of what to look for when assessing this beautiful art form is enjoyable for the curious, and vital for the investor or connoisseur. Here’s some information that we hope will provide a starting point. Oriental rugs are hand-knotted pile or flat woven rugs made in the weaving regions from Morocco to China, produced by artisans with a range of local materials and traditions following a lineage stretching back over two thousand years. Up to the 1860s, rugs were woven with the superior quality of hand-carded and hand-spun wool, and dyed with vegetable dyes. Over time, commercially produced rugs began to dominate the rug weaving regions. The quantity increased to meet demand, but this was at the expense of quality. By the middle of the 20th century, almost all rugs used inferior machine carded and spun wool, and synthetic chromium dyes, and the traditional methods were all but completely lost. During the 1970s, thanks to the work of the dedicated German chemist Harold Boehmer, there was a great effort to revitalize some of the traditional weaving communities and preserve this exquisite art form. 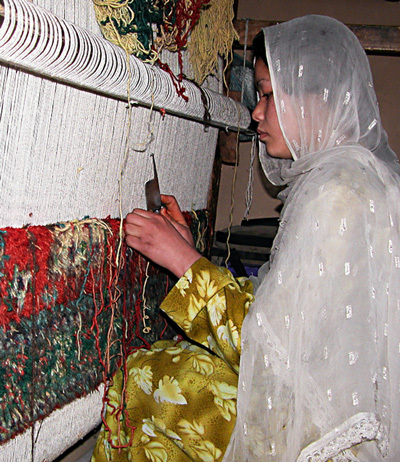 The further development of Cultural Survival projects, such as Barakat founded by Chris Walter in Afghanistan, Pakistan, India, and Nepal, have enabled communities to return to traditional rug production methods, and outstanding examples of rug weaving continue to be available in small quantities today. Working directly with Mr. Walter, we have been importing these extraordinary rugs and presenting them at The Magic Carpet for the past 15 years. When we appraise a rug, we start by assessing the age, condition and rarity. We assess whether it was made during a time when quality materials were used, or while industrial methods dominated the market. We check how worn the rug is, and whether the rug has been cared for and washed periodically. We also see if the rug is in need of repairs, or if existing repairs are of good quality. We consider the rug’s provenance and desirability in today’s market. We continue by looking at the quality of the wool, the best wool being from sheep raised in higher altitudes, shorn at specific times of the year, and the wool hand-washed, carded and spun to preserve its natural oils and lanolin and long staple fibers. Rugs made with this wool will last for many decades, will wear beautifully, and are likely to become prized antiques for future generations. We evaluate the dyes. Traditionally wool is dyed using native plant materials. These vegetable dyed rugs have a wonderful, natural harmony of color unmatched by synthetic dyes. We also consider the quality of weaving, including the evenness of the knots, the knot density (the number of knots per square inch), the way the pile has been trimmed, the fringes tied, and the edges (selvage) wrapped. Finally, we look at the delineation of the design which incorporates motifs and symbols inherited and interpreted from age-old traditions. The balance and symmetry of a classical rug, the rhythm and geometry of a tribal rug, or the playfulness of a whimsical creation each has its own place in what a rug lover or investor greatly values. At the Magic Carpet, we specialize in authentic hand-made Cultural Survival Project rugs, truly the antiques of the future. Rug expert Paul Jorgensen continues to offer ORRA (Oriental Rug Retailers of America) certified appraisals for any purpose including personal, resale or insurance. The Magic Carpet will be offering monthly educational articles on the extraordinary art and history embodied by Oriental rugs. In our next article we will be exploring the benefits of sustainably produced Cultural Survival rugs. For any questions about Oriental rugs, please contact us at 530-265 9229 or at . We are located at 408 Broad Street(The New York Hotel)in Nevada City.